When you think agriculture and horticulture irrigation, right away you think of Toro. 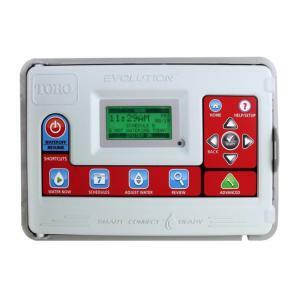 The Evolution AG Irrigation and Fertigation Controller has all the features today's growers are looking for. This intuitive and economical controller allows for expansion of up to 16 zones, fertilizer injection (2 pump capacity), pulse irrigation, propagation and misting schedules, plus the freedom to program valves to your specific needs: from 1 second to 24 hours. It will operate up to four valves at one time; is rain and soil sensor compatible; is housed in a durable case; and can be controlled wirelessly via the Handheld Remote Control (sold separately). See the attached manufacturer information for complete details of operational features for agriculture to horticulture to fertigation, propagation and pulse irrigation.